Every dentist knows, that patients simply hate the “bee sting” effect or even the sight of a needle with anaesthetic. We use an amazing solution to the problem – special hand piece, similar to a pen, which is controlled by a computer. It allows us to anaesthetise any tooth, even the most difficult one, with no pain whatsoever. It is almost too good to be true, but we’re offering painless dental care in Crouch End! Numerous patients, who got more nervous just seeing a syringe or needle, now do not have to worry. The CompuDent system with the Wand solves that problem. Very compact, lightweight handpiece, which looks like a pen, is connected to a computer, which precisely controls the flow of anaesthetic. No more needles, no more unnecessary pain meaning, even more comfort. 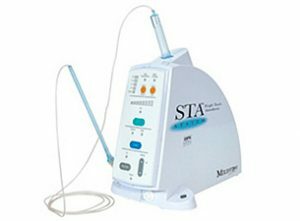 The additional advantage of using the Wand is the minimisation of the tongue, cheek or face numbness during and after the procedure. No “fat lip” after visiting the dentist’s office? At Blue Light Dental Clinic it’s a standard.